Michael Gotta of the Burton Group sums up the role of Web feeds and attention in addressing two of the major issues facing IT organizations and information workers. "Providing users with the right information, at the right time, in the right context has been the holy grail for IT organizations. At the same time, users have been frustrated with either too much information, too little information, information that isn't timely and information that isn't relevant." Attensa is announcing two new products that address these issues head-on. For enterprises and IT organizations, Attensa is introducing the Attensa Feed Server, the first Enterprise Feed Server Appliance. The Attensa Feed Server is an appliance that can be easily installed behind the firewall and enables IT administrators to easily set up and manage feeds for groups and individuals enabling improved collaboration and knowledge sharing. 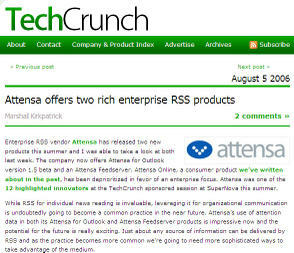 For knowledge workers, Attensa is announcing the public beta of a new version of Attensa for Outlook, the first RSS reader utilizing AttentionStream technology to automatically prioritize information based on the user’s behavior history to automatically bring the most important RSS feeds and articles to the top. Take a look at our new Web site update. You can find detailed Attensa Feed Server information here and you can download the beta of Attensa for Outlook 1.5 here. Charlie Wood interviewed Matthew Bookspan, Attensa's Director of Product Management and KnowNow's CTO Ron Rasmussen for his first podcast. It’s solid overview on the state of the enterprise RSS market, how companies are using RSS and the road ahead. The audio makes everyone sound like they are in a Warner Brother’s cartoon but stick with it.